Hope today has been kind to you all. At the moment I needed to make a quick birthday card as a friend of mine has her birthday in 4 days time, but I am seeing her tonight. I went to my Bebunni floral cd rom and I can say I needed a slapped hand as it was still celophaned eek. But my god like the rest of the Bebunni range I love it. I used pink pearls and I also cut out happy birthday (Britannia die) with mirri paper then used my xyron to put the sentiment through to make it sticky. This is gorgeous, love the cute bunny! 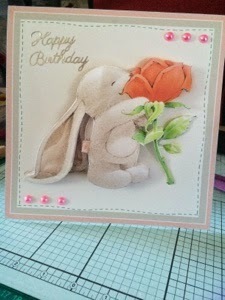 Love that little bunny - super card!